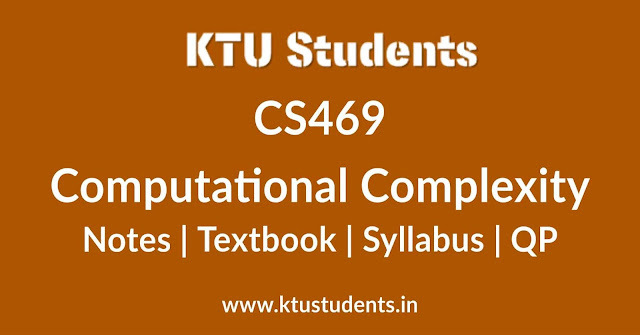 APJA KTU B.Tech Seventh Semester Computer Science and Engineering Branch Subject, CS469 Computational Complexity Notes, Textbook, Syllabus, Question Papers are given here as per availability of materials. Introduction: Easy and hard problems. Algorithms and complexity. Turing machines: Models of computation. Multi-tape deterministic and non-deterministic Turing machines. Decision problems. The Halting Problem and Undecidable Languages: Counting and diagonalization. Tape reduction. Universal Turing machine. Undecidability of halting. Reductions. Rice's theorem. Deterministic Complexity Classes: DTIME[t]. Linear Speed-up Theorem. P Time. Polynomial reducibility. Polytime algorithms: 2-satisfiability, 2-colourability. NP and NP-completeness: Non-deterministic Turing machines. NTIME[t]. NP. Polynomial time verification. NP-completeness. Cook-Levin Theorem. Polynomial transformations: 3- satisfiability, clique, colourability, Hamilton cycle, partition problems. Pseudo-polynomial time. Strong NP-completeness. Knapsack. NP-hardness. Space complexity and hierarchy theorems: DSPACE[s]. Linear Space Compression Theorem. PSPACE, NPSPACE. PSPACE = NPSPACE. PSPACE-completeness. Quantified Boolean Formula problem is PSPACE-complete. L, NL and NL- completeness. NL=coNL. Hierarchy theorems. Randomized Complexity: The classes BPP, RP, ZPP. Interactive proof systems: IP = PSPACE. Optimization and approximation: Combinatorial optimization problems. Relative error. Bin-packing problem. Polynomial and fully polynomial approximation schemes. Vertex cover, traveling salesman problem, minimum partition.